The screenshot above is hosted and provided by technoriversoft.com. Please contact them directly for any copyright infringement as we are not responsible for that content. Word to HTML Converter is a Microsoft Word add-in for converting word documents to HTML. This professional tool allows you to publish a Word document like a press release, technical manual or other specifications on the web in a fast, easy and automatic manner. 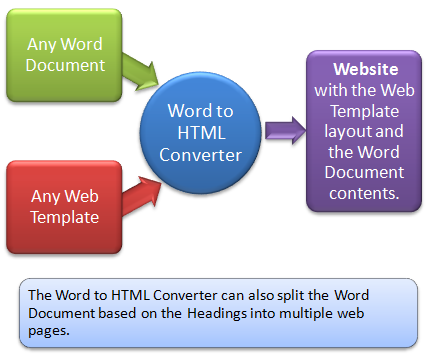 Why use Word to HTML Converter ? 1. Specify the look and feel of the converted web pages with a custom template. This can be a template that you are already using for your current website. Thus, the tool allows you to convert existing Word documents to professional looking, customized web pages easily and quickly. 2. Split a single Word document into several web pages based on their logical sections. The information in the document can then be viewed naturally as multiple webpages over the web. 3. Increase your productivity by using the Word document as a single source for distributing information online. Everytime your information changes, you will only need to modify the Word document and generate the web pages automatically. 4. Produce professional Help specifications on the Web painlessly. 5. Make use of all the above capabilities in an existing environment (Microsoft Word) that you are comfortable with.